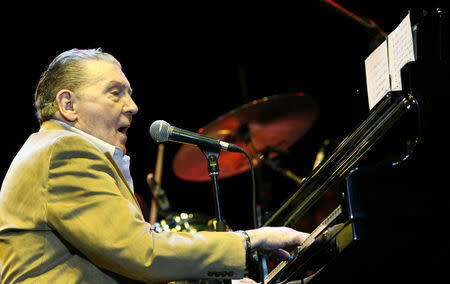 LOS ANGELES (Reuters) - Rock 'n' roll pioneer Jerry Lee Lewis has been discharged from a hospital to a rehabilitation center in Memphis, Tennessee, two weeks after suffering a stroke, his publicist said on Monday, quoting his doctor as saying Lewis is expected to fully recover. Farnum quoted the performer's neurologist, Dr. Rohini Bhole, as saying the prognosis for Lewis was promising, two weeks after being hospitalized for a stroke. "Jerry Lee is expected to fully recover with aggressive and intensive rehab," Bhole said. "From what I have seen thus far, he is heading in the right direction." Farnum said the hospital and rehab center were both in Memphis, about 20 miles (32 km) north of Lewis' current ranch home in Nesbit, Mississippi. Lewis, nicknamed "The Killer," was among the very first class of musicians inducted into the Rock and Roll Hall of Fame, and his raucous piano style on such hits as "Great Balls of Fire" and "Whole Lotta Shakin' Goin' On," was essential in shaping the early sound of rock.